One cold March a few years ago I was travelling through New England on a short holiday after a week’s work in New York. I didn’t have any rooms booked or arrangements made and this had led me on a round-about route driving towards towns that were previously just names, but were now places to me: Provincetown, Newport, and then Concord. What brought me there was a book I had read as a student that had affected me (and many others) deeply. Walden: A Life in the Woods (first published in 1854) was written by Henry David Thoreau about his experiences of building and then living in a simple cabin in 1845-7. It is in part a philosophical treaty about life and how to live it, but also an extremely practical guide to self-reliant rural existence. Not much over a mile from the town centre, I found Walden Pond still in existence (preserved since 1962 because of its link with Thoreau), and once I was in the woods that surrounded the water, it felt very easy to imagine what it was like there back in the nineteenth century. After the winter, the woods felt untended and torn about, with fallen trees across the narrow paths, crushed sodden leaves and mud underfoot. On a slight rise I found Thoreau’s tiny house – a very small rectangular building with a single window and door and a chimney rising from the rear. It felt incredible it was still there, despite being located in what has now become in effect a city park. It didn’t look out of place, or out of time. It was wholly familiar, an archetypal form – the same sort of building can be found in woods, in fields, in gardens all over the world. Recently, I have been updating my entries for the Encyclopedia of Vernacular Architecture of the World, which is to have a new edition. I also wanted to write a new one on the recent Tiny House movement. The Tiny House is a very small dwelling that provides comfort and security for its inhabitants at minimum cost. Often, though not always, these buildings are made from readily available, easily worked, commercially produced materials (particularly sawn timber) and built by their future occupant. They are usually single-space dwellings, sometimes with an open loft for sleeping reached by a ladder or steep stair. Off-grid houses utilise solar panels, wood burners, and bottled gas for energy needs and reclaimed water, chemical toilets or outhouses for sanitation, however, many are also connected permanently or temporarily to conventional services. The roots of the Tiny House are in the humble buildings that new settlers first built when homesteading North America in the 17th, 18th and 19th centuries – although it could be argued that they go back even further as these where based in turn on earlier European rural precedents. These were simple, often one-room buildings built on minimal stone foundations, made from local timber hewn to shape. Rather than the log cabin, it is the framed wooden building, clapboarded or shingled, with pitched roof that the contemporary Tiny House emulates. The historic model would have paper-lined or plastered interior walls, a stone chimney, a very small window or sometimes just a door for ventilation and light. Though modern buildings are often built to the same or better construction standard as full-size houses, contemporary Tiny House owners, relate to the early settlers’ way of life using minimal resources. An important reference point is also Walden, as it was a precursor for advocating domestic sustainable responsibility. Tiny House builders and owners stress not only the economic benefits of living in this way (small if any mortgage, low day-to-day household costs), but also the ecological benefits of using minimal resources and stepping away from a consumer culture that appears to emphasise bigger is better. There is also a special sense of connection to a building they have made themselves, and even if they have used other people’s plans and commercially available components, houses are usually tuned to the needs of the builder/occupant. Thoreau’s cabin has strong credentials for being the first genuine Tiny House, not because it was the first dwelling of its type – there were many more prototypes built centuries before – but because it was the first built in this way with the idea of creating a new lifestyle as an antidote to the rush of civilisation, though not as a refuge or hermitage. Of course the cabin I saw was not the original but a replica. In fact the site itself was lost until archaeological work in the 1940s by Roland Robbins rediscovered its location. Nevertheless, at Walden Pond I stood at the hut’s entrance and looked around imagining what it would have been like for Henry, doing his eccentric intellectual thing (and it was viewed as decidedly weird by his contemporaries). 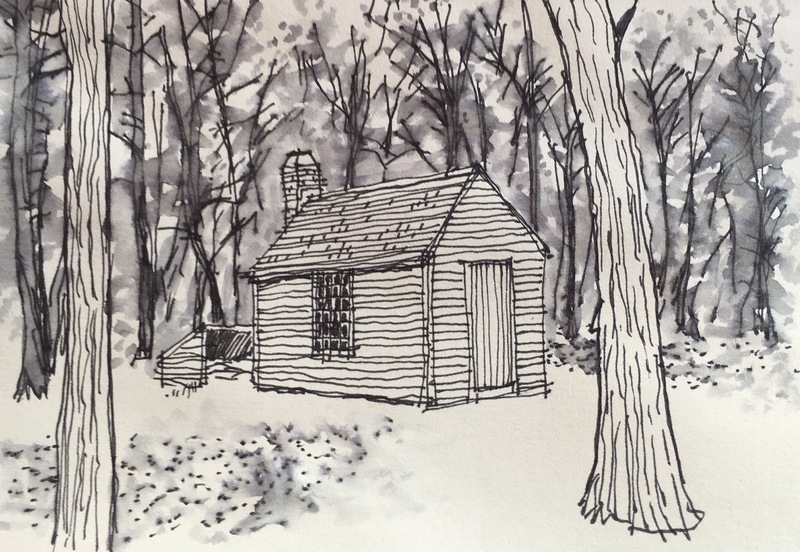 Thoreau was reconnecting with the roots of his country and the settlers which a couple of hundred years before him had done exactly the same thing he had, building small cabins in the country in order to found a new way of life. Writing about in the way he did he was not looking backward but forward, contemplating and experimenting with new reasons why, if you could, it was important to build your own dwelling, make use of available resources sustainably, and live comfortably to have time to take pleasure in what you do.